In four programmes shown on BBC 2 Dr Amanda Foreman has roamed the globe and travelled through the millenia to uncover stories of women who have made and changed human history from 10,000 BC to the present day. You can – for a short time – view all four programmes on the BBC iPlayer – click here. Episode 4 – ‘Revolution’ – includes a section in which I talk to Amanda about Millicent Fawcett – highlighting her work as a champion of women’s education. The filming was done in my drawing room – and it was an interesting and enjoyable way to spend a morning – talking about such an agreeable subject with someone so passionate and knowledgeable. Especially so as barely a month previously I had been lying on an operating theatre table. It was good to get back to ‘work’. 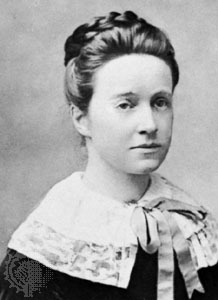 For much more about Millicent Fawcett – and all the other Garretts – see Enterprising Women: the Garretts and their circle. This entry was posted on September 24, 2015, 12:16 pm and is filed under Suffrage Stories, The Garretts and their Circle. You can follow any responses to this entry through RSS 2.0. You can leave a response, or trackback from your own site.